We woke up early and a quick glance at the newspaper told us that there was no war resolution in sight. We dressed and at 10 AM we headed towards the old city. The walk to the old city was short and pretty. We entered the city through the Jaffa gate. The tourist center was right at Jaffa gate. Outside, was a sign for “free tours” given by Sandemans free tours. Curious we asked them what it was about and why “free”. Turns out they provide free tours for two reasons: a) They believe that every beautiful city should be seen and understood by people visiting and b) Hope that you will like the free tour and sign up for one of their paid tours. c) The tourist guides make money from the free tour with tips. This was similar to the “name your own price” and I felt that the tips given would be decent enough for the guide to make it worth his or her while. We did sign up for the free tour. If we have multiple days in the same place, we like to get a high level overview of the place and then walk about the place at a more leisurely pace, but now equipped with more knowledge, the next day. This tour allowed us to do just that. We also noticed there were a lot of free lance tourist guides. Official tourist guides charge in the order of NIS500-800 and unofficial ones charged NIS200. One of the things that perplexed me about Israel was that I was never able to tell what the “right” price of anything was and everything just seemed expensive. While we waited for the tour to start, we bought a rather large bagel (about 9 inches in diameter). I was hoping it would come with some butter, but it only came with some spice and was pretty hard. Not at all fun as I hoped it would be. Our tour guide was Gil, a Jewish Canadian who had immigrated to Israel with his wife and kids. He was also a part-time journalist for the Jerusalem Post and was working to get his tourist license, which apparently is not an easy task in Israel. The tour started at Jaffa gate and we quickly walked into the labyrinth of ancient alleys to the Armenian quarter. On the way we saw a map of the Armenian genocide, an event hotly contested between Turkey and the rest of the world. At this spot the guide told us about the history of the genocide and every-time I hear it, it reminds me of how horrific and brutal the human race can be, although it doesn’t have to be. Sad. From there we walked over to a few Armenian handicraft shops where we saw what was unique Armenian designs. The shop, however was quite expensive for our wallets. Lovely art and someday, we decided, we would definitely come back to buy some. We walked over to the Jewish quarter and Gil took us to a roof-top above the shops from where we had a fabulous view of the Western Wall and the Dome of the Rock. We sat there for 20 minutes taking in the scene and watching the Haredim rush by in their black dress. Up a flight of stairs and we were in a lovely courtyard. We could see lots of yeshiva students, either on a break of running to class. We got some ice-cream from a shop and sat in the courtyard enjoying the vibe. It was a crisp day, the sun’s rays perfectly warm and the garden’s flowers in bloom. From the Kotel, we walked into the Muslim quarter of Jerusalem. Unfortunately, the IDF security presence in this area was massive and we could only go through certain parts. We walked through a street lined with lots of shops and there were a lot of Arab women shopping (meat, sweets, vegetables). We ambled slowly taking in the whole scene and finally reached the Austrian Hospice. 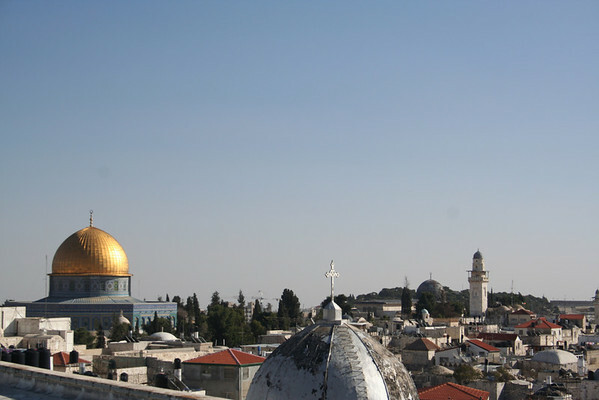 Through an inside connection, Gil arranged a spectacular view of Jerusalem on the roof! Gil pointed out so many historical landmarks to us that we lost count after a while. 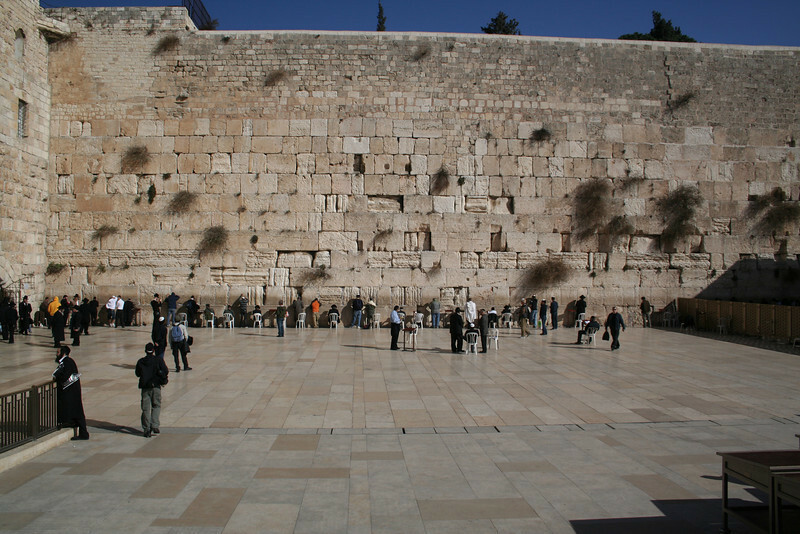 Like most of Israel, the history overwhelms you! From the hospice we made our way to the spot which marks the first station of the Via Dolorosa! That is, the marker today. It has changed over time.It is the route, Jesus supposedly walked when he was made to carry the cross before his crucifixion. Gil explained to us that the current presumed route has been in existence since the 18th century and is most likely historically inaccurate. Here’s why: The route is supposed to be from Pontius Pilate’s residence to the spot where he was finally crucified. If you’re Pontius Pilate and living in Jerusalem, you’ll probably live in David’s Citadel (which is near Jaffa Gate) and not near the Kotel. Like many things, this is then, probably, a route of convenience. Regardless, the excitement for us is the history that comes with it. Once a light bulb died in one of the common areas. The priest who saw it freaked out since if he tried to change it the other denominations would almost go to war with his denomination. He called the IDF, completely panicked. The IDF gathered all the different denominations and while they discussed the best course of action, one of the soldiers quietly replaced the dead bulb. Problem solved! There is another infamous story where one of the Ethiopian priests moved his chair closer, but not in, the Coptic territory and there was a complete riot (physical) between the two denominations because the Coptics viewed this move as hostile! The hostility is clearly evident by the infamous stair that is currently outside one of the windows of the church. This ladder has been there since before the 1850′s since none of the denominations can agree on what to do with it. 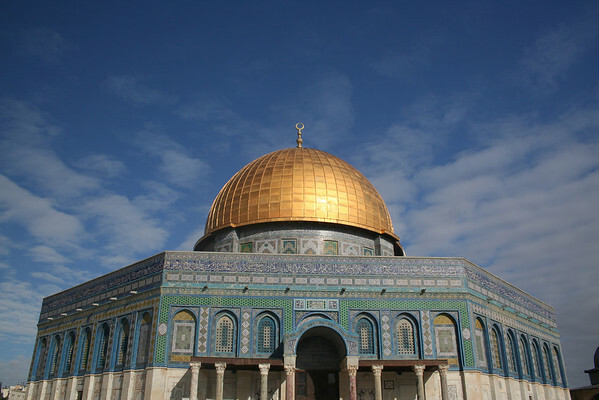 The keys of the church are with the Nuseibeh family, Palestinian Muslims, since the current denominations can’t agree on any provisions to open and close the gates amongst themselves. Petty centuries old fights aside, this is still the most important place of worship for Christians! This is where Jesus was believed to be crucified and the rose marble sarcophagus where Jesus’ body was cleaned after his crucifixion is also here. We entered the church and spent some time walking around. Afterwards, we exited the church and passed by the Mosque of Caliph Omar. 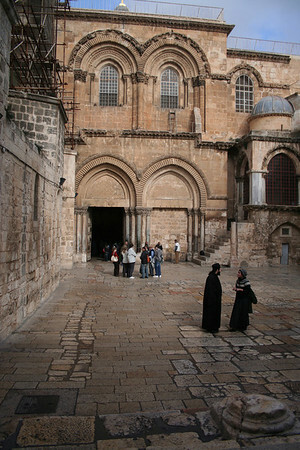 Legend has it that when Caliph Omar came to Jerusalem, the priests of the church invited him inside to pray. He respectfully declined stating that if he came in to pray, later generations of his followers would then fight to lay claim to the church in his name and so he decided to pray outside the church. As expected, there is a mosque in his name, right outside the church today! Then, we passed by St. Marks Syrian Orthodox Church, apparently the location of Jesus’ last supper! We found our way back through the Jewish quarter to Jaffa gate, where the tour ended. We took a group shot and said our goodbye’s. It was almost 2 pm. Time for some food! We picked a random restaurant and got a hummus bowl, pita bread and mint chay. The hummus was excellent and the hot tea warmed us in the cold winter. We walked back to our hotel and rested. In the evening we decided to have dinner at and Indian restaurant listed in the Lonely Planet guide. Sadly, the restaurant was not there at the address listed (this is the second time Lonely planet gave me instructions to places that just did not exist). We quickly made a decision to go to a well known Indian restaurant in Jerusalem, Kohinoor Indian Restaurant (we had not had Indian food in almost 10 days). This is a Kosher restaurant and serves meat and hence no dairy. The long cab ride gave us a glimpse of Jerusalem at night. Kohinoor is located in the Crowne Plaza hotel and the hotel was full of Haredim getting ready for Shabbath in the hotel. The food, sadly, was disappointing. We got rice, aloo gobhi and another potato dish and it simply lacked spices. The service and ambiance was excellent. Quite a few people have asked me why we try to have Indian food in random countries – We’re vegetarian and in most countries, there is sometimes limited food for us. We also love rice and dal and after a few days crave it. Hence we indulge in Indian food every few days to satisfy our cravings. After dinner, we took a taxi back to the hotel. It was a long day and we both fell asleep almost immediately.